Should You Unplug During Vacation? The season of Lent is upon us, a season of 40 days leading up to Easter. Lent marks a time of prayer, fasting, and almsgiving for many Christians – a way to clear the mind and cleanse the soul. Whether you are religious or not, there’s great value in considering the symbolism behind this number – 40. In Biblical times, 40 signified a period of inner transformation. Moses and the Israelites wandered in the desert for 40 years. Jesus spent 40 days of prayer and fasting in the desert. The apostles received 40 days of formation between the resurrection of Jesus and his ascension into heaven. How could the number 40 work for you? Call it Lent, or just call it a time of self-reflection and improvement. Either way, ask yourself these two basic questions: What needs transforming in my life? What simple, doable steps can I take to accomplish a transformation over the next 40 days? As a corporate trainer, I have the opportunity to experience every sort of workplace imaginable – large or small, healthy or ailing, pleasant or painful. Peering in from the outside of various company staffs, two things I’ve observed for sure: there are a lot of workplaces that could use a good shot of Joy; and, a little Joy can go quite a long way in transforming a culture. Mind you, this can be said of families too. Whatever plot of land you choose to cultivate, workplace or home, what would the next 40 days look like for you if you decided to plant more Joy there? Recently, I discussed this topic with my sister. It sparked a memory of a Lenten season long ago when she determined to make an attitude change. A particular classmate of hers just drove her “up a wall” and she found it difficult to be nice to her. For 40 days she decided to be intentionally kind to Suzanne O’Malley. The outcome continues to stun my sister to this day. Her relationship with Suzanne O’Malley transformed into a trusted and admiring friendship. All for a 40-day effort in kindness. Where and how can you stage a 40-day Joy transformation? Wait! Don’t stop reading this now, just because 40 days is way too long of a commitment. You can seriously handle a small change of attitude or behavior for 40 short days. Is there someone at work or home you need to be kinder to? Someone who could use a little Joy in their life? Do your co-workers, partner, or children need a morale boost, and could a smattering of Joy here and there be the catalyst? Do you really have to be so somber and negative every week at that meeting? Does every family dinner have to end in frustration? 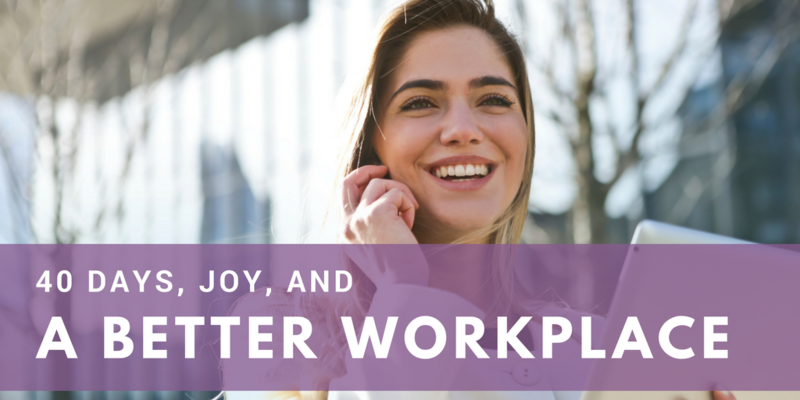 Could a slight reorientation toward Joy turn the mood and brighten the outcome of tedious tasks or difficult people? You know, Joy isn’t a random occurrence that is out of your control. Joy is a choice. Regardless of external circumstances, you can choose Joy for yourself and you can spread Joy to others. Donald Clifton, the Father of Positive Psychology, asks this question: What will happen when we think about what is right with people, rather than fixating on what is wrong? Try that question out for the next 40 days, even if you direct it toward only one person. What relationship or environment can you help transform with a little more Joy and a little less judgment for a short 40 days? Chances are, you just might be stunned by the outcome too. We at Purple Ink would love to hear your personal story about this 40-day Joy challenge. Please email and let us know how it turns out: denise@purpleinkllc.com. You might even find yourself featured in our next JoyPowered book!